By combining many of their biggest sellers into one comic, DC's Justice League of America kicked off the most popular gig in the industry - the team title. 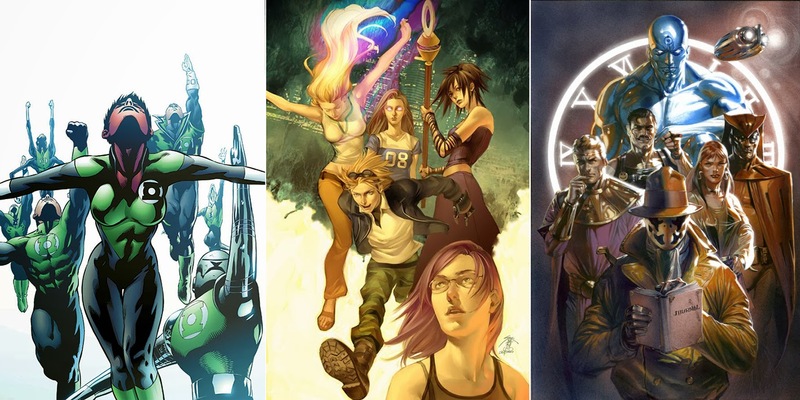 With so many great squads throughout comics, it's surprising Top 10 lists always get stuck showcasing the same old crews. The next row back are more diverse in concept if not better! By averaging Google's top Top 10 super-team lists (found here, here and here), the 'Usual Top 10' are; X-Men, JLA, Avengers, Fantastic Four, Suicide Squad, Birds of Prey, Authority, Defenders, Teen Titans and The Justice Society. Putting those repetitive faces out of contention, here are the Top 10 OTHER Super-Hero Teams In Comics. 10) THE RENEGADES (Valiant) Move aside GEN13. These gifted teens / 'Harbinger's' on the run, face an opposition more relentless than most; their former captor / 'ultimate Harbinger' Toyo Harada. To have a shot at life, the Renegades find freedom blocked by an army of Harbingers still under Toyo's control - and a whole world of hurt. 9) THE GREEN LANTERN CORPS (DC) No offence S.H.I.E.L.D., but Fury doesn't bark like Kilowog. The ultimate line in universal law enforcement, Green Lantern's Kyle Rayner, Boodikka, Sodam Yat and more, face planetary civil wars, The Sinestro Corps and deciphering the truth from the secrets laid by their founding fathers, The Guardians. 8) RUNAWAYS (Marvel) Discovering their parents are super-criminals, these teens abandoned codenames and spandex cliches to turn against their 'caregivers' and save L.A. Armed with their parents own gadgets and a dinosaur, the newfound family now ensure other rogues reject following in their parents footsteps, just like they did. 7) WATCHMEN (DC) Now sure, technically the cast of marvelous mini-series Watchmen, were thin covers over Chalton Comics' Sentinels of Justice, but the dynamics of the crew didn't get turned from 10 to 31 until Dr Manhattan and Silk Spectre talked on the moon. The most amazing thing about this landmark series? In just twelve issues, the entire creative team introduce us to new faces and fleshed out their pasts, hates and affections, leaving them feeling more known to us, then casts of teams who have had twelve issues every year for decades. Who Makes The Top Six? Click through to the next page and see, right here. 6) GUARDIANS OF THE GALAXY (Marvel) Mickey Mouse hopped on a Steamboat and the world clapped, when Rocket Raccoon steps on a spaceship evil the galaxy over changes its pants. Not only is the foul mouthed mammal a force to be reckoned with, he comes with the ultimate rag-tag team of Han Solos the cosmos has ever had. And with every step they take, the fate of at least one universe falls in their lap. 5) THE LEAGUE OF EXTRAORDINARY GENTLEMEN (Wildstorm) As a kid I always wanted to see The Thing fight Dr. Jekyll's Mr Hyde - the Victorian horror himself not Hulk or Marvel's Hyde - there is a difference. The L.E.G. proved that by forming a 'Justice League' of cult literary classics, such as Mina Harker, Captain Nemo and The Invisible Man, and setting them against the War of The Worlds. 4) PLANETARY (Wildstorm) If League of Extraordinary Gentlemen gathered classics to become a classic, Planetary did it better by having 'archaeologists of the impossible' explore icons to become iconic. Aiming to discover the planet's secret history, and funded by the Fourth Man, Elijah Snow, The Drummer and Jakita Wagner explored alternate reality nods to Tarzan, Doc Savage, Green Lantern and The Fantastic Four among others. 3) WILDC.A.T.S (Wildstorm) A lady cyborg with attitude, an alien warrior commander, the best gunman ever and the top alien menace in comics are just a few parts of what makes this team tick. 'Mr Majestic' Jim Lee's first crack at a creator-owned title plants it's Maul sized feet in this chart, leaving footprints all over alien Daemonite skin. 2) DOOM PATROL (DC) As much as Fantastic Four was a base for The Incredibles, so to was The Doom Patrol a foundation it seems for Dreamworks' Monsters vs Aliens. The original alienated freaks, Robotman, Negative Man and Elasti-Girl battle the strangest and most bizarre adversaries on the planet and beyond, from transvestite living streets to the Brotherhood of Evil and even plans of their founder Doctor Niles Caulder. It's the future's highest honour to be given a Legion flight ring, and done right, it's a privilege in the present day to read their adventures too. 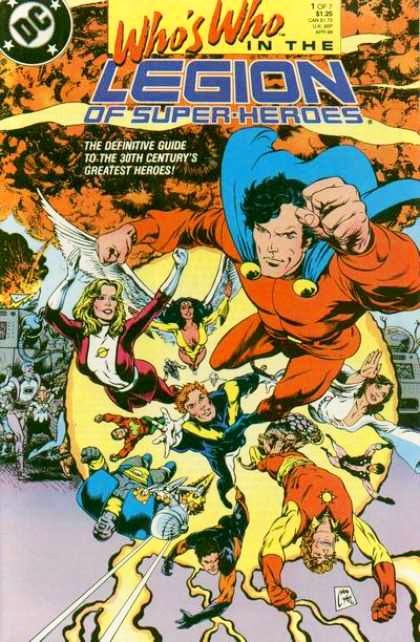 Set against the backdrop of the universe of 31st century DC, there is no epic too big for the adventures of the Legion of Super-Heroes. A galactic U.N. of sorts, featuring the best young heroes the cosmos has to offer, the inter-planetary conflicts they find themselves embroiled in are only part of the big changes and character drama the team consistently faces. Motivated and inspired by the legend of Superman, Legionnaires such as Mon-El, Timberwolf, Dawnstar, and Cosmic Boy all know the definition of what it means to be a hero and set out to show the rest of the universe exactly what that means. What do you think? Ruling out the usual Top 10 listed at the start of this article, who would make up your 'Top 10 OTHER Super-Hero Teams In Comics? Must agree about the Watchmen - its a sign of its superb writing that its so fondly remembered. AND the LSH also - it feels like a school gang being in that team, but a good school gang. I just adore it [ and btw must get my zine in on time for my next APA due next Wednesday]. Fly, Fly-Girl, the Shield and, er, the others. Great Silver Age team-up in the best Avengers tradition. Their mixture of Cold War super-villains and technology made them kiddie favourites for me. And Wally Wood artwork! Reason enough to buy it. The team that wont go away, with endless reboots that barely match the original. the FF before the FF, these non-super-powered fellas had limited time to fight evil yet never flinched, never faltered. You wanted guts and a never-say-die attitude? Ask the Challs...the comic-book equivalent of the A-Team. DCs answer to the X-Men...they hoped. 36 issues of seven teens, each from a different planet, on the run from Darkseid and hiding out at Crossroads, an interdimensional hotel that was the gateway to anywhere. Leader of the Seven was female and the book boasted the largest female cast ever in comics. Labyrinthine, twisting plots and intense characterization was the hallmark of Chris Claremonts and Ron Lim's opus. a spin-off from the LSH, these seven aliens had an unremarkable guest-appearance in the LSH book but rather a remarkable first issue of their own title...they were all KILLED OFF in issue one! Resurrected by a Dominator [one of the LSHs own foes] for nefarious purposes they had heightened powers and extreme personalities. A good mix of the X-Men and the Guardians of the Galaxy. Robotman, Negative Man/Woman, Elasti-Girl, Tempest, Changling...these oddballs were kooky but fun, so beloved, so...well its hard to describe them. Whether youre a fan of the 60s version, the sophisticated 70s version or the madcap 80s weirdos, you cant help but adore the Patrol; the X-Men without all that confusing continuity, And like the Wanderers they were killed off too, but with them they sacrificed themselves to save innocents. True Heroes! No seriously, ummm, I could easily toss in Cyberforce, Uncle Sam and his Freedom Fighters, The Champions? (thought I'd toss that in for Gary ol chap and Karl god bless the pervert that he is;). Damn fine list. Can't disagree...except for LoSh. Thanks guys - this was hard to do unbiasedly. Personal favs like The New Warriors, Midnight Sons and Heroes For Hire skipped out, but I'm pretty stoked at the list it left, yeah Dale even the Legion. Hey I'm sure your last name spelt magnetically is Cosmic Boy, so maybe you oughta check it out. Read Abnett and Lanning's Legion Lost maxi-series and see if you still aren't converted. Promise I'll stop signing your email address up to every e-newsletter I can find if you do. Karl, seems we all agree on the DP, I slotted them in at #2 but there needs to be more art of these guys! Decent pics are just to few and far between. I did think of Challengers, and the Agents, but the Seven I didn't even think of. That book was everywhere here - on more newsstands then the X-Men - in the 90's!! I think when I hear Americans etc saying the book was scarce it's because DC accidentally mailed them all south. Whoops! I used to love Soveriegn Seven but my God what a frustrating exercise that turned out to be - Im a fast reader but even I took nearly a month going thru all 36 issues, plus the two one-offs they had. Claremont practically wrote a book of dictionaries putting this book together, it had that many words; I did like the characters tho - the teenage Viking Thor wannabe, the two women leaders [were they sisters. lesbian lovers or princess and servant, one could never guess correctly] and the oft-confusing plot that meandered...and meandered,,,I loved the Batman crossover with the 'Contagion' storyline and the one-off LSH/Seven special which counts as one of my faves from the 90s LSH run, where half the team was stranded on 20th century Earth. You could almost say it was a three-way crossover with Wonder Woman as her old nemesis Dr Psycho was the villain in this one. Ive got three S7 merchandise - the trade paperback of the first seven issues, a black S7 t-shirt and a cute purple and black S7 badge. My only slight tinge of sadness regarding this book was that when issue one came out in '95, my father had passed away that same week, and I always associate this series with that unfortunately, and Ive only re-read the entire series since because. I think that's a well under-sung aspect of comics Karl. For collectors and fans they work just like photographs or songs - you can remember exactly where you were or what happened to you on days you got certain issues or heard certain comic news. The Death of Superman one of those for sure.